Add new currencies to your org. Summarize the impact of using single currency versus multiple currencies. Set up Advanced Currency Management. 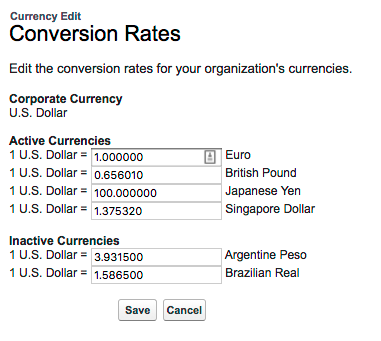 Edit conversion rates, and enable users to select personal currencies. Whether you live the intriguing life of an international spy, or you’re in a slightly less exciting 9-to-5 situation, understanding the value of deals is a top priority. In Salesforce, you can specify which currencies your organization uses, and individual users can apply specific currencies to their settings based on where they do business. 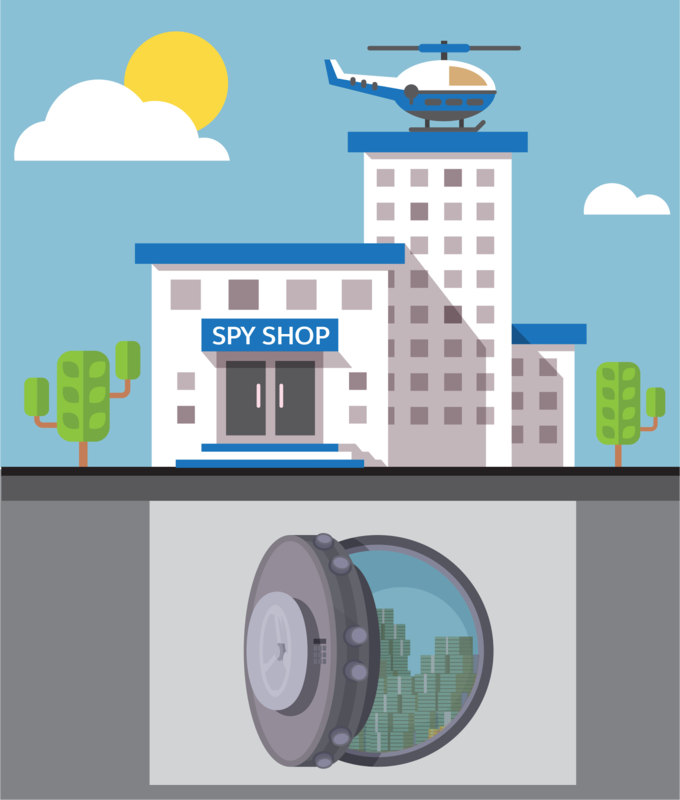 Mom & Pop’s Spy Shop was single currency when they started using Salesforce, and were only dealing with United States–based clients. So when their admin set up the company settings, they set their default locale and currency locale as English (United States). They did business only in the United States so transactions were reported solely in USD. But after being acquired by the Nacho Secrets Agency, Mom & Pop’s began to take on an international clientele. It was time to move from a single to a multicurrency setup. Doing so is pretty painless (and doesn’t involve any stealthy spy tools). But a word of warning—once a multicurrency setup is enabled, it can’t be disabled. We walk through some of these steps here, but see the Resources section for more details. Deactivating a currency does not alter amounts in items that use that currency, but your users are no longer able to enter new amounts using the inactive currency. And deactivating a currency that’s set as a user’s personal currency automatically resets the user’s currency to the corporate currency. You can opt for a new corporate currency as soon as it’s configured if you need to relocate in a hurry. In the Active Currencies list, click Change Corporate. 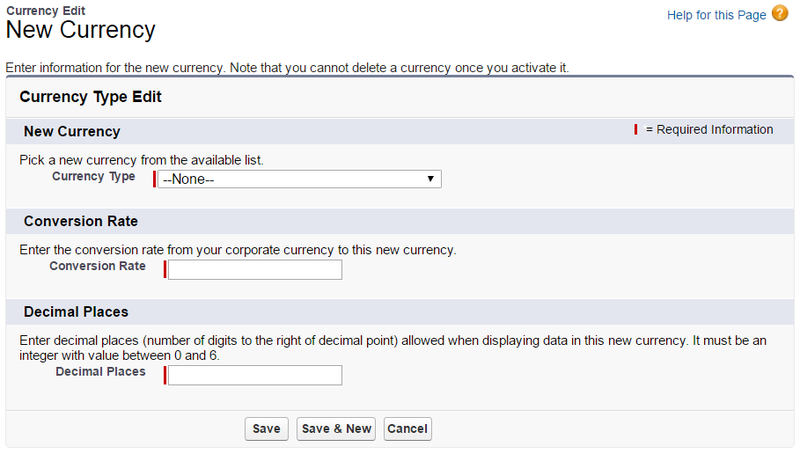 Select your new corporate currency from the dropdown. Only currencies that have been added and are active are available. 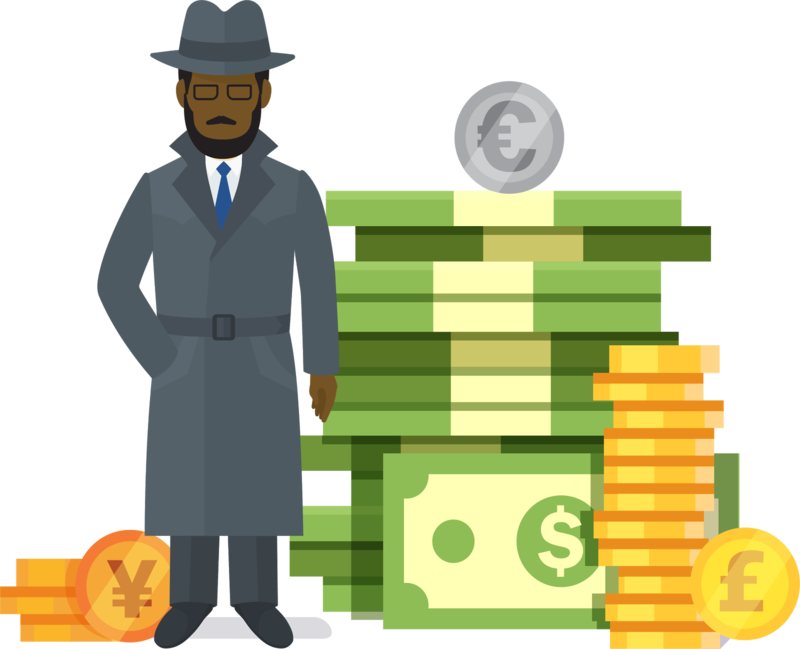 Ensure all the secret agents in your global organization use up-to-date currency values for deals by editing conversion rates. This lets you manage the static exchange rates between your active and inactive currencies and the corporate currency. In the Active Currencies or Inactive Currencies list, click Edit Rates. Enter the conversion rate between each currency and your corporate currency. Your currency amounts update using the new rates. Note: Previous conversion rates are not stored and all conversions within opportunities, forecasts, and other amounts use the current conversion rate. While standard conversion rate control is straightforward, it impacts current and closed deals. For accurate historical record keeping, it’s best to avoid impacting the value of completed business. Advanced Currency Management for currency fields on opportunities and opportunity products lets you manage exchange rate start dates. On January 1, you update the exchange rate to 1 USD = 0.9464 EUR. On February 1, you change the exchange rate to 1 USD = 0.9353 EUR. So which rate is used for your opportunities? Under Advanced Currency Management is not enabled, click Enable. If you receive a pop-up message that reads: Navigate to this page? Click the Open button. When advanced currency management is first enabled, your existing exchange rates automatically become the first set of dated exchange rates. These rates are valid for all time, until you define another set of exchange rates. Once multicurrency is enabled, currencies are activated, and conversion rates are edited, instruct your users at Mom & Pop’s to add personal currencies to their profiles. Now they can correctly track their new work (and get paid). Click your profile image at the top of the page and click Settings. Enter Language in the Quick Find, then select Language & Time Zone. Update the Currency field, and click Save. Since Pop is devoting all his time to a long-term, top-secret case for a client in Luxembourg, he sets his currency to EUR-Euro so his transactions are reported in euros. Meanwhile, Mom does clandestine work for clients in multiple countries, so she leaves the currency on her personal settings page as USD-U.S. Dollar and manages each account’s currency individually. Now each user in their agency has a personal currency. It is used as the default currency in quotas, forecasts (depending on which forecasting version they use—see the resources section for more help), opportunities, quotes, and reports. Doing business in a currency familiar to users and customers removes an unnecessary hurdle (and keeps us away from calculators). When your global operation sets up multiple currencies, conversion rate control, and personal currencies, you free up your agents to focus on the work itself, not the value of the dollar that day. And now that you’ve gathered all the intel on currencies and company settings configuration, you can tackle the important work of updating your org to run more efficiently.